Oracle Real Application Cluster (RAC) is a revolution in the database management system. It is an extension of Oracle single instance database. RAC is basically a cluster of instances working on the same database. As you know instance is nothing but the computer memory and some background processes, so in case of RAC we have multiple such instances which are installed and configured on different nodes and we have a single database (datafiles) which are accessed by these instances. This post explains the technical details about the RAC architecture and also I will discuss about the installation of RAC. What is Oracle Real Application Cluster 10g? A RAC is a clustered database. A cluster is a group of independent servers that cooperate as a single system. In the event of system failure clustering ensure high availablity to the user. Access to mission critical data is not lost. Redundant hardware components, such as additional nodes, interconnects and disks, allow the cluster to provide high availability. Such redundant hardware architecture avoids a single point of failure and ensures high availability for the system. Above figure shows the architecture for RAC. In RAC each instance runs on a seperate server which can access database made of multiple disks. For RAC to act as a sngle database, each seperate instance in a RAC should be a part of cluster. For the external users all the instance (nodes) which are part of cluster will look as single instance. For each instance to be a part of cluster, we need to have some cluster software installed and all the instance should register in the cluster software. From Oracle Database 10g onwards, Oracle provides its own clusterware, A software to be installed on the nodes which are the part of cluster. Advantage with Oracle clusterware is that customer doesn’t have to purchase any third party clusterware. Also the clusterware provided by Oracle is integrated with OUI for easy installation. When a node in a Oracle cluster is started, all instances, listener and services are stared automatically. If an instance fail, the clusterware will automatically restart the instance so the services is often restored before the administrator notices it was down. Each RAC node should have at least one static IP address for the public network (Used by application) and one static IP address for the private cluster interconnect. Also we can have 1 virtual IP address(VIP) for each node. The private networks are critical components of a RAC cluster. The private networks should only be used by Oracle to carry Cluster Manager and Cache Fusion (Explained Later) inter-node connection. A RAC database does not require a separate private network, but using a public network can degrade database performance (high latency, low bandwidth). Therefore the private network should have high-speed NICs (preferably one gigabit or more) and it should only be used by Oracle. Virtual IPs are required for fail over. This is called TAF (Transparent Application Failover). Processes external to the Oracle 10g RAC cluster control the Transparent Application Failover (TAF). This means that the failover types and methods can be unique for each Oracle Net client. For failover to happen client connections are made using VIPs. Both Oracle Clusterware and Oracle RAC require access to disks that are shared by each node in the cluster. The shared disks must be configured using OCFS (1 or 2), raw devices or third party cluster file system such as GPFS or Veritas. OCFS2 is a general-purpose cluster file system that can be used to store Oracle Clusterware files, Oracle RAC database files, Oracle software, or any other types of files normally stored on a standard filesystem such as ext3. This is a significant change from OCFS Release 1, which only supported Oracle Clusterware files and Oracle RAC database files. Note that ASM cannot be used to store the Oracle clusterware files, since clusterware is installed before installaing ASM and also clusterware have to be started before starting ASM. OCFS2 is available free of charge from Oracle as a set of three RPMs: a kernel module, support tools, and a console. There are different kernel module RPMs for each supported Linux kernel. Installing a RAC is a 5 step process as given below. Environment Configuration, Kernel parameter and so on. You can create unix user groups and user IDs using groupadd and useradd commands. We need 1 oracle user and 2 groups – “oinstall” being the primary and “dba” being secondary. These are the minimum required values, you can have higher values as well if your server configuration allows. Hangcheck-timer module monitors the Linux kernal for extended operating system hangs that can affect the reliability of RAC node and cause database corruption. If a hang occurs, the module reboots the node. You can check if the hangcheck-timer module is loaded by running lsmod command as root user. If the module is not running you can load it manually using below command. /etc/hosts contains the hostname and IP address of the server. You will need 3 hostnames for each node in the cluster. One will be public hostname for primary interface. Second will be private hostname for cluster interconnect. Third will be virtual hostnames (VIP) for high availability. You have to get the following directories created for you with a write permission for oracle user. The OUI detects whether the machine on which you are installing RAC is a part of cluster. If its a part of cluster then you have to select the other nodes which are the part of cluster and on which you want to install the patch. But when OUI tries to install the patch on other node while connecting from 1st node, it will ask for login credential and prompt for a password in between the installation, which we want to avoid. For this purpose we have to have user equivelence in place. User equivalence can be achieved by using SSH. First you have ot configure SSH. In this step, use SSH to copy the content of the ~/.ssh/id_rsa.pub and ~/.ssh/id_dsa.pub public key from all Oracle RAC nodes in the cluster to the authorized key file just created (~/.ssh/authorized_keys). Now that we have the entry for all the public keys on both the node in this file, we should copy the file to all the RAC nodes. We done have to do this on all nodes, just copying the file to other nodes will do. Once SSH is configured we can go ahead with configuring user equivalence. Try the below command and it should not ask for the password. It might ask the password for the first time, but after that it should be able to execute the steps without asking for password. In order to use OCFS2, you need to first partition the unused disk. You can use “/sbin/sfdisk –s” as a root user to check the partitions. We will be creating a single partition to be used by OCFS2. As a root user, run the below command. When finished partitioning, run the ‘partprobe‘ command as root on each of the remaining cluster nodes in order to assure that the new partitions are configured. We will be using OCFS2 here in this installation. OCFS is a cluster file system solution provided by Oracle, which is specially meant for RAC instllation. Once configure the disk for OCFS we can use the same for clusterware files (like OCR – Oracle Cluster Registry file and Voting file), as well as we can use the same disk for database files. Click on Add on the next window, and enter the Name and IP Address of each node in the cluster. Apply, and Close the window. You now need to configure the on-boot properties of the O2CB driver so that the cluster stack services will start on each boot. You will also be adjusting the OCFS2 Heartbeat Threshold from its default setting of 7 to 601. All the tasks within this section will need to be performed on both nodes in the cluster as root user. The following questions will determine whether the driver is loaded on boot. The current values will be shown in brackets (‘’). Hitting <ENTER> without typing an answer will keep that current value. Ctrl-C will abort. As root on each of the cluster nodes, create the mount point directory for the OCFS2 file system. Run the below command as a root user only on 1 node to create a OCFS2 file system on the unused disk /dev/sdc1, that you partitioned above. The meaning of the above command is partition with a volume label of “/u03” (-L /u03), a block size of 4K (-b 4K) and a cluster size of 32K (-C 32K) with 4 node slots (-N 4). Once OCFS2 filesystem is configured on the disk, you can mount the same. Run the below command on all nodes to mount the disk having OCFS2 file system. As root user, run the following commands on node1 only. Since /u03 is on a shared disk, all the files added from one node will be visible on other nodes. Before installing the Oracle RAC database, we need to install Oracle clusterware. Clusterware will create 2 important files. One is the OCR file (Oracle Cluster Registry) and other is Voting file. OCR file is used for registering the nodes involved in RAC installation and to store all the details about those nodes. Voting file is used to get the status of each node after a definite period of time. Each node will register its presence after a definite time into this voting file. This is called heart beat of RAC. If a node goes down, then it wont be able to register its presence in voting file and other instance will come to know. Other instance will then bring up the crashed instance. Follow the below step to install clusterware. Below are the main screen and the inputs to be given. Specify Home Details – Specify the correct location of home. Provide the location for crs home. Note that this location may not be a shared location. This is the location for installing a crs software and not for OCR and voting file. Product Specific Prerequisite Checks – OUI will perform the required pre-reqs checks. Once done, press Next. Specify Cluster Configuration – On this screen you need to add all the servers that will be part of RAC installation. Basically this is a push install, where the installation will be pushed to all the nodes we are adding here. So that we “don’t’ have to install CRS again from node 2. Specify Network Interface Usage – We need at least 1 network to be private and not to be used by application. So make 1 network as private network, so that we can use the same for interconnect. Specify OCR Location – This is where you will provide the location for OCR file. Remember that this file should be shared and accessible to all the nodes. We know that we have a shared disk /u03. In the above step under “Create the directories for shared files”, we created a “/u03/oracrs” directory. This can be provided here. Specify Voting Disk Location – On this screen you will provide the location for voting file. You need to provide the shared location here as well. You can provide the same shared location we created in above step. You can verify the cluster installation by running olsnodes. You can follow the same steps that you follow for installing the single instance database, only couple of screens are new in this instllation as compared to single instance database installation. 4) Specify Hardware Cluster Installation Mode – Select cluster installation and click on select all to select all the nodes in the cluster. This will propogate the installation in all the nodes. 10) Specify Database Storage Options – In this case if you are not using ASM or Raw devices and using file system then specify the shared location we created above. This is important because all the instance should have access to the datafiles. We are creating multiple instances but we are having single database(database files). At the end, it will give the summary and you click on install. Congratulations! Your new Oracle 10g RAC Database is up and ready for use. 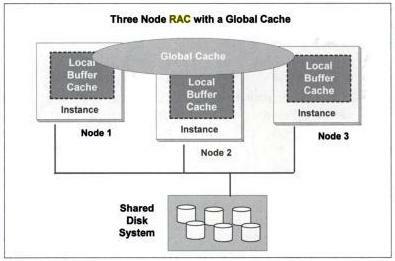 This post is about Oracle Cache Fusion technology, which is implemented in Oracle database 10g RAC. We are going to discuss just about cache fusion. You should have the architecture knowledge about RAC. Please check Oracle documentation for understanding Oracle RAC architecture. Also you can visit my previous post about Oracle RAC installation to get some basic information and installation details. Cache fusion technology was partially implemented in Oracle 8i in OPS (Oracle Parallel Server). Before Oracle 8i the situation was different. If we take a case of multi-instance Oracle Parallel server and if one of the instance ask for a block of data which is currently modified by other instance of same database, then the holding instance needs to write the data to disk so that requesting instance can read the same data. This is called “Disk Ping”. This has greatly effected the performance of the database. With Oracle 8i, partial cache fusion was implemented. Oracle 8i (Oracle Parallel Server) has a background process called “Block Server Process” which was responsible for cache fusion in Oracle 8i OPS. Following table gives the scenario when cache fusion works in Oracle 8i OPS and scenario where cache fusion was not working. Offcourse these limitations are not present in Oracle 10g RAC. So when requesting instance ask for a block which is present in holding instance in a read or write mode and if the block is dirtied, then cache fusion used to work and block from cache of holding instance used to get copied to requesting instance. But if block is not dirtied and block is present in holding instance then requesting instance has to read the block from datafile. Also if the block is opened for write in holding instance and other instance wants to update the same block then holding instance have to write the block to disk so that requesting instance can read it. Cache Fusion basically is about fusing the memory buffer cache of multiple instance into one single cache. For example if we have 3 instance in a RAC which is using the same datafiles and each instance is having its own memory buffer cache in there own SGA, then cache fusion will make the database behave as if it has a single instance and the total buffer cache is the sum of buffer cache of all the 3 instance. Below figure shows what I mean. This behavior is possible because of high speed interconnect existing in the cluster between each instance. Each of instance is connected to other instance using a high-speed interconnect. This makes it possible to share the memory between 2 or more servers. Previously only datafile sharing was possible, now because of interconnect, even the cache memory can be shared. But how this helps? Well, for example if we have a data block in one of the instance and its updating the block and other instance needs the same data block then this data block can be copied from holding instance buffer cache to requesting instance buffer cache using this high-speed interconnect. This high speed interconnect is a private connection made just for sending data blocks and more by instances. External users cannot use this connection. It is this interconnect which makes multiple server behave like a cluster. These servers are bind together using this interconnect. Moving further, now we know how the cluster is formed and what is the back bone of cluster and what exactly we call “cache fusion”. Next we will see how cache fusion works. But before that we need to discuss few important headings which is very important to understand. I promise this wont be too heavy. Lets look into the overview of these concepts. I wont be going into the details, just sufficient for you to understand cache fusion. If we consider a single instance database, whenever a user queries for data he gets a consistent view of data. For example another user has already read a block of data and changed some rows in buffer cache. If another user want to read the data from same data block then Oracle will make a copy of that data block in buffer cache and apply the undo information present in undo tablespace to get a consistent view of data. This consistent data is then presented to user who wants to read the data. This is called maintaining consistency of data. Now consider a multi instance system RAC, where a data block might not be present in same instance. A user might be updating data block in some other instance. If data block are already available in local instance then they will be immediately available to the user. if they are present in some other instance with in the cluster, they will be transfered into local buffer cache. Maintaining the consistency of data blocks in the buffer cache of multiple instance is called “Cache Coherency”. Multi version consistency model distinguishes between current version of data block and one or mode read consistent version of data block. The current block is the one which contains all the changes, committed as well as uncommitted. Example a user fired a DML on a data block which is not present in any of the instance. Then this block will be read from disk into buffer cache where the value gets changed. After then user commits and fires another DML on same data block. Now that data block is dirty and contains committed as well as uncommitted changes. 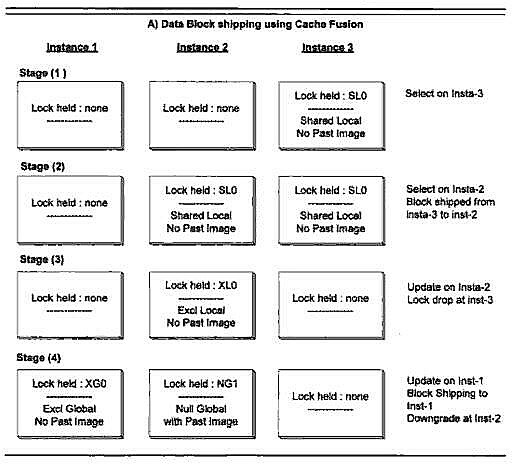 Suppose this data block is requested by another user for reading, then oracle will make a copy and apply undo information and make a Consistent Read “CR” copy of this block and ship it to requesting instance. Thus we have multiple versions of same data blocks, each of them are consistent with respect to the user who requested. During the course of operation there can be many more version of same data block, each of them consistent with respect to some point in time. In case of multi instance system such as RAC, where same resources (example data block) are getting used concurrently, effective synchronization is required for maintaining consistency. With in the shared cache, co-ordination of concurrent task is called synchronization. The synchronization provided by Oracle RAC provides a cluster wide concurrency of resource and in turn ensure integrity of shared data. All though there is synchronization within the cache, there is some cost involved for doing the same. If we talk about low level operation of synchronization, its just a data copy operation or data transfer operation. According to Oracle studies, accessing the block in a local cache is much faster then accessing the block from another instance cache with in the cluster. Because with local cache is the in memory copy and with other instance cache, the data transfer needs to be done over high speed interconnect which is obviously slower then in memory copy. Worst is the copy from disk, which is much slower then above two process. Below graph shows the block access time using these 3 methods. Global Cache Service (GCS) is the main component of Oracle Cache Fusion technology. This is represented by background process LMSn. There can be max 10 LMS process for an instance. The main function of GCS is to track the status and location of data blocks. Status of data block means the mode and role of data block (I will explain mode and role further). GCS is the main mechanism by which cache coherency among “multiple cache” is maintained. GCS is also responsible for block transfer between the instances. Global Enqueue Service (GES) tracks the status of all Oracle enqueuing mechanism. This involves all non-cache fusion intra instance operations. GES performs concurrency control on dictionary cache locks, library cache locks and transactions. If performs this operation for resources that are accessed by more then once instance. Enqueue services are also present in single instance database. These are responsible for locking the rows on a table using different locking modes. To understand more about enqueues, check Oracle documentation about locking. Image of data block – Could be current image or past image. Null (N) Mode: Null mode is the least restrictive mode. It indicates no access rights. It acts as a place holder. Exclusive (X) Mode: Exclusive mode indicate exclusive access to block. Other resource cannot have write over this data block. However it can have consistent read on this datablock. Local: When a data block is first read into the instance from the disk it has a local role. Meaning that only 1 copy of data block exists in the cache. No other instance cache has a copy of this block. Global: Global role indicates that multiple copy of data block exists in clustered instance. For example a user connected to one of the instance request for a data block. This data block is read from disk into an instance. The role granted is local. If another instance request for same block this block will get copied to the requesting instance and the role becomes global. This role and mode information is maintained in GRD (Global Resource Directory) by GCS (Global Cache Service). Past Image concept was introduced in Oracle 9i to maintain data integrity. In an Oracle database, a typical block is not written to disk immediately after it is dirtied. This is to reduce excessive IO. When the same dirty block is requested by some other instance for write of read purpose, an image of the block is created in owning instance and then the block is shifted to requesting instance. This image copy of the block is called Past Image (PI). In the event of failure Oracle can reconstruct the block by reading PIs. It is also possible to have more then 1 PI of the block, depending on how many times the block was requested in dirty stage. A past image of the block is different then CR (Consistent read) image. Past image is required to create CR by applying undo data. An additional concurrency control concept is the buffer state which is the state of a buffer in the local cache of an instance. The buffer state of a block relates to the access mode of the block. For example, if a buffer state is exclusive current (XCUR), an instance owns the resource in exclusive mode. With a block access mode of NULL the buffer state name is CR — An instance can perform a consistent read of the block. That is, if the instance holds an older version of the data. With a block access mode of S the buffer state name is SCUR — An instance has shared access to the block and can only perform reads. With a block access mode of X the buffer state name is XCUR –An instance has exclusive access to the block and can modify it. With a block access mode of NULL the buffer state name is PI — An instance has made changes to the block but retains copies of it as past images to record its state before changes. Only the SCUR and PI buffer states are Real Application Clusters-specific. There can be only one copy of any one block buffered in the XCUR state in the cluster database at any time. To perform modifications on a block, a process must assign an XCUR buffer state to the buffer containing the data block. For example, if another instance requests read access to the most current version of the same block, then Oracle changes the access mode from exclusive to shared, sends a current read version ofthe block to the requesting instance, and keeps a PI buffer if the buffer contained a dirty block. At this point, the first instance has the current block and the requesting instance also has the current block in shared mode. Therefore, the role of the resource becomes global. There can be multiple shared current (SCUR) versions of this block cached throughout the cluster database at any time. Lets consider a very details example of how the block transfer happens between different instances. For explaininng this example I am assuming a 3 node RAC system and also another assumption is that any DML statement is followed by a commit. So if I say that a user executed update that means user executed update + commit. But there is no checkpoint until the end. Stage 1) In stage 1 datablock is requested by a user C who is connected to instance 3. So a datablock is read into the buffer cache of instance 3. Assume this gives a value of 30. This block is read for the first time and its not present in any other instance. So the role of block is LOCAL and the block is read in SHARED mode. Also there are NO PAST IMAGES. So we describe this stage has instance 3 having SL0 mode (SHARED, LOCAL, 0 PAST IMAGES). Stage 2) In stage 2 user B issues the same select statement against the salesman table. 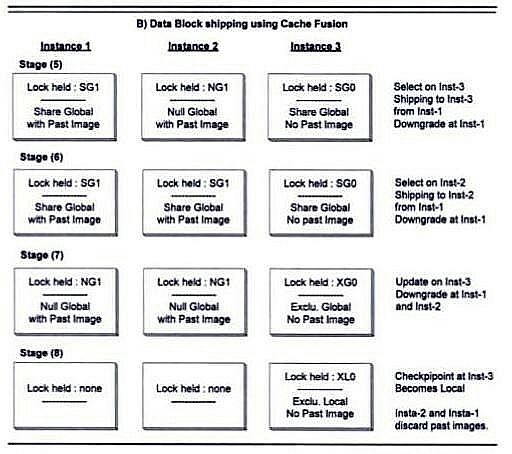 Instance 2 will need the same block; therefore, the block is shipped from instance 3 to instance 2 via cache fusion interconnect. There is no disk read at this time. Both instances are in SHARED mode (S) and role is LOCAL (L). Here if you see carefully that even though the block is present in more then once instance, still we say that role is local because the block is not yet dirtied. Had the block been dirty and then requested by other instance, then in that case the role will change to global. Stage 3) In stage 3 user B decides to update the row and commit at instance 2. The new sales rank is 24. At this stage, instance 2 acquires EXCLUSIVE lock for updating the data at instance 2 and SHARED lock from instance 3 is downgraded to NULL lock. So instance 2 is having a mode XL0 (Exclusive, Local with 0 past images) and instance 3 is having a NULL lock, which is just a place holder. Also the role of the block is still LOCAL because the block is dirtied for the first time only on instance 2 and no other instance is having any dirty copy of that. If another instance now tries to update same block the role will change to global. Stage 4) In stage 4 user A decides to update in instance 1 the same row and hence the same block with salesrank of 40. It finds that block is dirtied in instance 2. Therefore the datablock is shipped to instance 1 from instance 2, however, a PAST IMAGE of the datablock is created on instance 2 and lock mode on instance 2 is downgraded to NULL with a GLOBAL role. Instance 2 now has NG1 (NULL lock with GLOBAL role and 1 PAST IMAGE). At this time instance 1 will have EXCLUSIVE lock with GLOBAL role (XG0). Stage 5) User C executes a select statement from instance 3 on same row. The datablock from instance 1 being the most recent copy (GRD (Global Resource Directory) knows this information about which instance is having the latest copy of datablock), it is shipped to instance 3. As a result the lock on instance 1 is converted to SHARED GLOBAL with 1 PAST IMAGE. The reason the lock gets changed to SHARED and not NULL is because instance 3 asked for shared lock (for reading data) and not exclusive lock (for updating data). If the instance 3 asked for exclusive lock then the instance 1 would have had NULL lock. Also the instance 3 will now hold SG0 (SHARED, GLOBAL with 0 PAST IMAGES). Stage 6) User B issues the same select statement against the salesman table on instance 2. Instance 2 will request for a consistent copy of buffer from another instance, which happens to be the current master. Therefore instance 1 will ship the block to instance 2, where it will be required with SG1 (SHARED, GLOBAL with 1 PAST IMAGE). So instance 2 mode becomes SG1. Stage 7) User C on instance C updates the same row. Therefore the instance 3 requires an exclusive lock and instance 1 and instance 2 will be downgraded to NULL lock with GLOBAL role and 1 PAST IMAGE. Instance 3 will have EXCLUSIVE lock, GLOBAL role and with no PAST IMAGES (XG0). Stage 8) The checkpoint is initiated and a “Write to Disk” takes place at instance 3. As a result previous past images will be discarded (as they are not required for recovery) and instance 3 will hold that block in EXCLUSIVE lock LOCAL role with no PAST IMAGES (XL0). Further if any instance wants to read or write on the same block then a copy will be again shifted from instance 3.